Since 1980 STEGO has been developing and producing innovative products for heating, cooling, temperature and humidity control of electronic enclosures. STEGO products are renowned for their reliability, long life, simplicity of use and high quality. 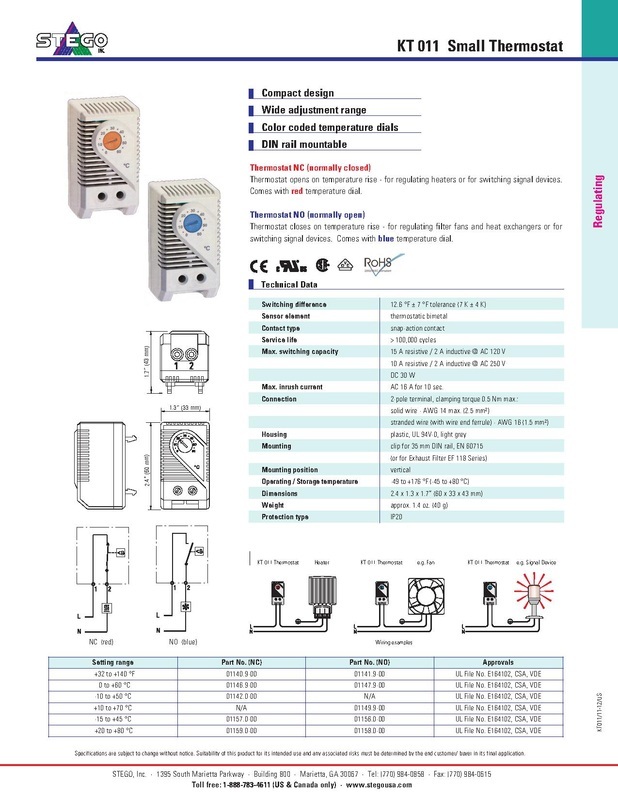 Besides properly sized heating or cooling devices in an enclosure, the appropriate temperature and humidity controls are necessary to guarantee the climatic conditions needed for trouble-free operation of electronic and electrical components. STEGO temperature and humidity controls can help achieve the ideal operating conditions even in the harshest environments. Thermostat opens on temperature rise - for regulating heaters or for switching signal devices. Comes with redtemperature dial. Thermostat closes on temperature rise - for regulating filter fans and heat exchangers or for switching signal devices. Comes with blue temperature dial. 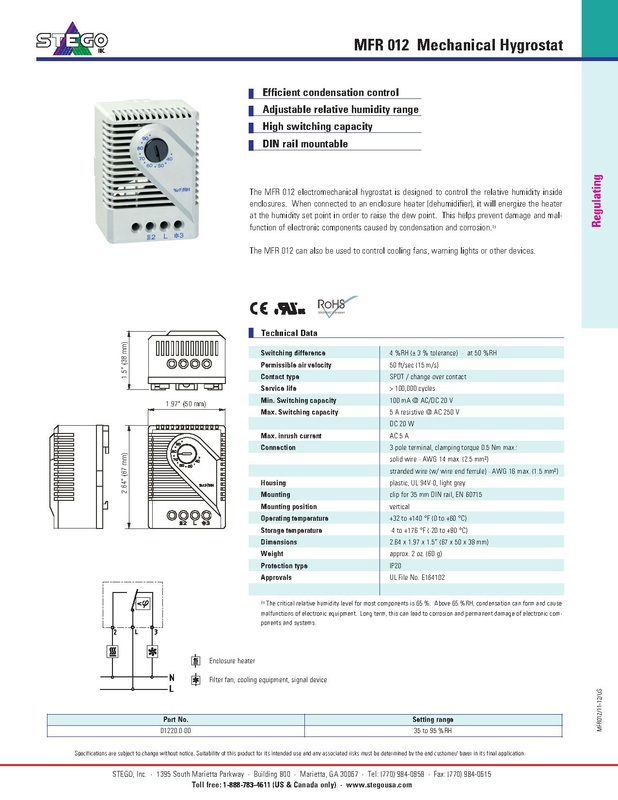 The MFR 012 can also be used to control cooling fans, warning lights or other devices. 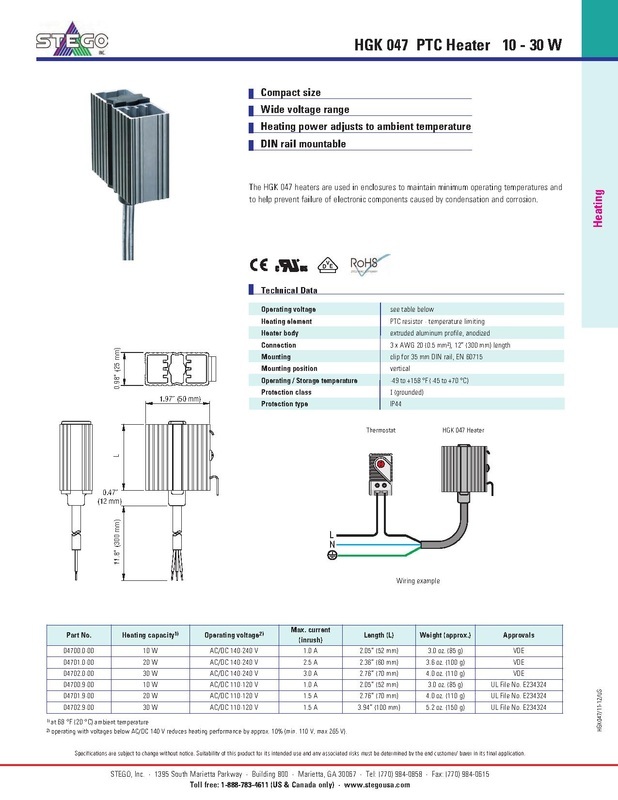 The HGK 047 heaters are used in enclosures to maintain minimum operating temperatures and to help prevent failure of electronic components caused by condensation and corrosion. 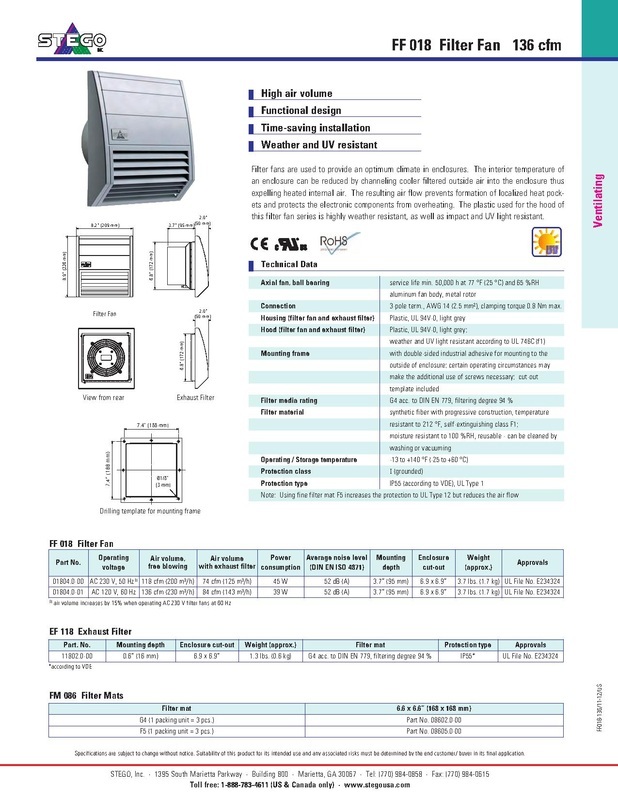 Filter fans are used to provide an optimum climate in enclosures. The interior temperature of an enclosure can be reduced by channeling cooler filtered outside air into the enclosure thus expelling heated internal air. The resulting air flow prevents formation of localized heat pockets and protects the electronic components from overheating. The plastic used for the hood of this filter fan series is highly weather resistant, as well as impact and UV light resistant. ilter fans are used to provide an optimum climate in enclosures. 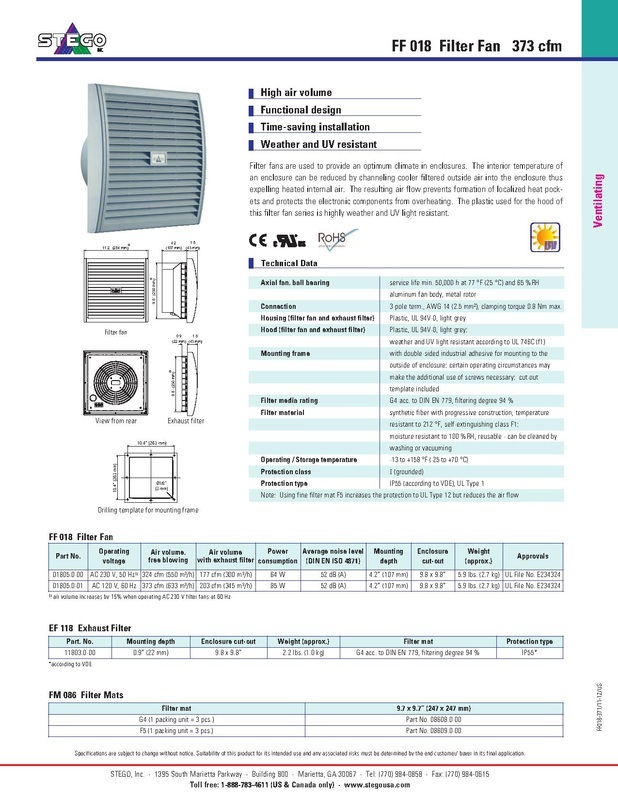 The interior temperature of an enclosure can be reduced by channeling cooler filtered outside air into the enclosure thus expelling heated internal air. The resulting air flow prevents formation of localized heat pockets and protects the electronic components from overheating. 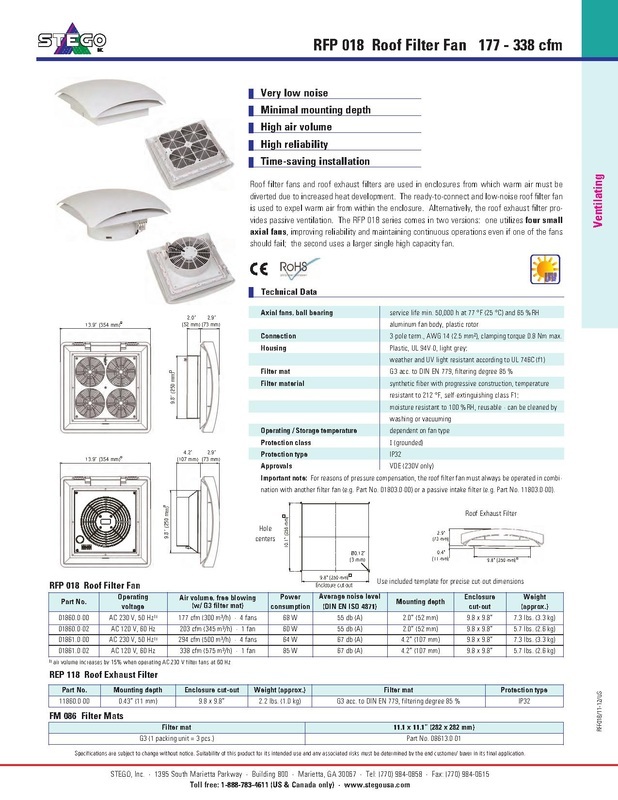 The plastic used for the hood of this filter fan series is highly weather and UV light resistant. should fail; the second uses a larger single high capacity fan.